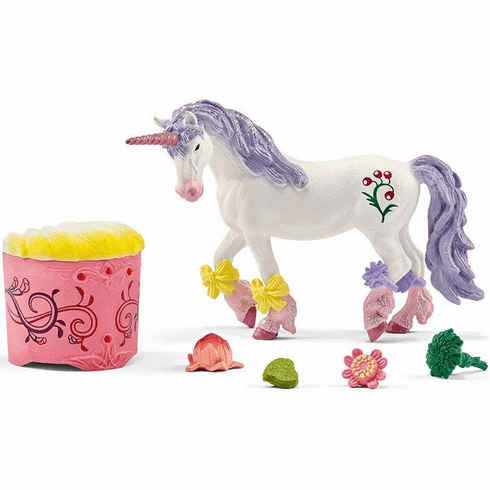 Unicorn and Pegasus Care and Feed Set. Feeding a Unicorn or Pegasus needs infinite patience, because these wonderful creatures are extremely shy and show themselves only very rarely. Once you have finally gained their trust, they can be stroked and sometimes they will even eat from your hand. But they really only eat the tastiest flowers and sweetest fruits. Their favorite mushrooms are even toxic to other creatures. Help the elves to feed and groom the unicorn. Removable ribbon and flower jewelry! Set Includes: 1x Exclusive Unicorn, 1 x jewelry box, 1x leaf bar for horses, 1x flower brush for horses, 1x herb bundle, 2x pin-on pink flower for horses, 2x yellow pin-on ribbon for horses , 1x red fruit. Unicorn approximately measures 5 inches long by 4 inches tall. Made of durable synthetic material by Schleich. Unicorn is Hand Painted.